This is because Tai Chi is the victim of a long series of misunderstandings, starting with its name itself: the most correct transcription would be “Taiji Quan”, generally translated as ”boxing of extreme polarity”. The most important word in this translation is actually Quan, which reminds us how Taiji Quan might be considered a martial art and have self-defense among its original principal purposes, the modern and politically correct way of defining the ability to give somebody a beating. Those elegant circles your grandmother traces in the air with her hands while she’s trying to keep up with the rhythm of her Tai Chi group? It’s really a series of hooks, leverages, thrusts, and blows to the throat and scrotum. Naturally, the majority of those who practice it completely ignore these applications and wouldn’t even have any ability (or intention) to do so, because we live in a civilized world where people go to the park to relax rather than fight. Add to this that the most widespread Taiji Quan style in the world is the Yang style, which emphasizes slowness of movement and hides well its martial arts potential. 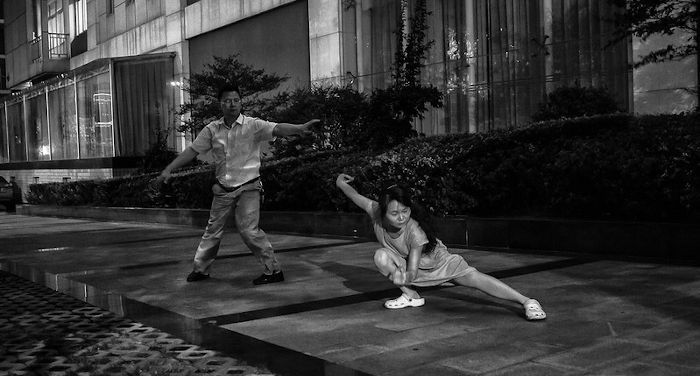 A different way to practice Taiji Quan, the Chen style, alternates slow winding movements with sudden changes of direction, explosive blows, jumps and kicks typical of Chinese martial arts, but has begun to make itself known to the public at large decades behind the Yang style and is therefore far less widespread in gyms and even less rooted in the collective imagination. And yet, between the two styles it is the Chen that is the most ancient: its limited (but growing) popularity is due to the fact that at the beginning of the last century the only place where it was possible to learn it was in a little village in the Chinese countryside, not far from the Yellow River, called Chenjiagou (陳家溝). Here, in the XVII° century, the general Chen Wangting defined his own style of combat, perhaps combining his vast expertise acquired in years of battle with Taoist philosophy. Here, between wheat fields and pastures, the style would be passed on from generation to generation strictly among the Chen family. It is here, that a master of the following age decided to break tradition and teach Taiji Quan to a willing student outside the clan, allowing for the creation of other styles and the diffusion of this martial art in all of China. Thanks to the legends of Taoist monks, immortals, serpents and herons, these are the origins of Taiji Quan that are most shared among historians and experts of the art of fighting with their hands. At the same time this is also one of the reasons why the remote village of Chenjiagou in Henan is considered by all the world to be sort of a Jerusalem of Taiji Quan, the place where this martial art has its beginning and where its most ardent practitioners dream one day to go and drink from the original source of knowledge, and brag to the beginners once they get back home. Another fundamental reason lies in the fact that here, for several centuries the most capable and famous Taiji Quan masters in the whole world continue to live and teach. All would be extremely more comfortable if Chenjiagou wasn’t in China, to tell the truth, but also extremely less entertaining. If you too are among the fans who want to touch the the dust trodden by Chen Wangting with your own hands and experience the intoxication of practicing with Taiji Quan superstars, the first step is getting to Zhengzhou, capital of Henan province. Zhengzhou is the classic Chinese metropolis of millions of inhabitants without hardly any touristic appeal. In exchange it is an important hub in the country’s railroad system, which makes it very easy to reach from any large city in China. If you’re in a rush to get trained, your best option is the high speed train: it makes frequent departures and in general advance booking isn’t necessary, takes about three hours and a half from Beijing and costs about 35 Euro. The normal train is more economical but obviously much slower; it could take you an entire night or half a day and moreover could be decidedly crowded. Another possibility is to travel by air, which costs more than the high speed train (give or take 100 Euro) and should be faster, but considering wait times and delays I recommend it only if the first option isn’t available. Once you arrive in Zhengzhou, head to the long distance bus station or “Er ma lu zhan”: from the “slow” train station – it isn’t very far and you could also get there on foot, while if you arrive via high speed train or by air you’ll have to take a taxi. At the station look for the bus for Wenxian, they depart with a certain frequency, so if you’re not in a rush wait for one with good suspension, because the trip will take at least a couple of hours. The alternative, which is much more expensive, is to take a taxi all the way to Wenxian or to Chenjiagou: if you’ve been in contact with a teacher before your arrival almost certainly they will have proposed this option. In any case, if you hope to get anywhere, be sure to always have handy the names in Chinese of your destinations, including the names of train and bus stations: taxi and car drivers do not speak English and as hard as you may try, your pronunciation will still be incomprehensible. The trip to Wenxianis in itself rather exciting, leaving behind the metropolises and crossing the Yellow River you will have the impression of having jumped back in time and entered a territory that is decidedly “rustic”, where the green cultivated fields alternate with the red of bare lands and reservoirs, while references to martial arts like decorative elements begin to abound even on the sides of the roads. Wenxian is a rather small city and once there you’ll have to change your mode of transport. Since you’re talking about a trip of only about ten minutes, you can handle any means you’re offered: car, van, apecar… the imagination of Chinese taxi drivers is limitless. All you have to do is show off your bags and whiteness in order to find someone who’ll give you a ride at a modest price; in this case it won’t be necessary to explain anything to the driver, all tourists that come to Wenxian are there just to get to the village of Chen. After a few kilometers the road changes to packed earth and you’ll be completely surrounded by fields of corn. 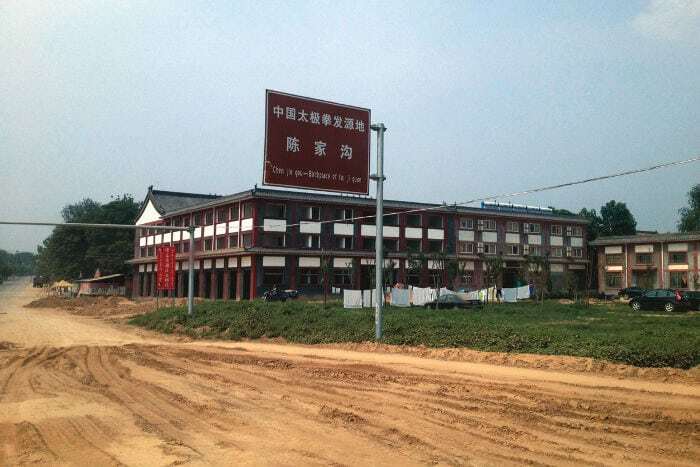 The first settlement you encounter is your goal: Chenjiagou, “Birthplace of Taiji Quan”, as is written on the street sign at the entrance to the village. “Chenjiagou”, or “the ditch of the Chen family”, takes its name from a ditch that runs along the borders of the village. The place is rather small and at first glance doesn’t offer many amenities: only one partially paved road, buildings from all ages but none of any architectural interest, a few modern but very, very ugly buildings, a pair of groceries and perhaps a teahouse. Later observations won’t improve on this first impression. There are no streetlights, not even one decent restaurant, and every so often you’ll have to step aside to allow a small flock of sheep to pass by. Dust is everywhere, covering the streets, windowsills, sheets hung out to dry, and your sweaty forehead. If you came here on vacation, then you probably were cheated. If instead you came here for the only plausible reason, namely your passion for Taiji Quan, in the center of the village you could visit a park dedicated to Taiji and its origins, a museum and a couple of small sporting goods stores that are well-stocked and inexpensive. As far as the possibility of intensive training, in Chenjiagou you’ll be spoiled for choice: right in the center of town you will find the “official” village school presently directed by Chen Xiao Xing and his son Chen Zi Qiang, while not far away you’ll find the school of Chen Zhao Sen and that of Zhu Tian Cai, other world famous masters. At the entrance to the village, right after you pass the street sign, you’ll find the new school of Chen Bing. There is no shortage of schools of lesser size and fame but still of the highest quality. 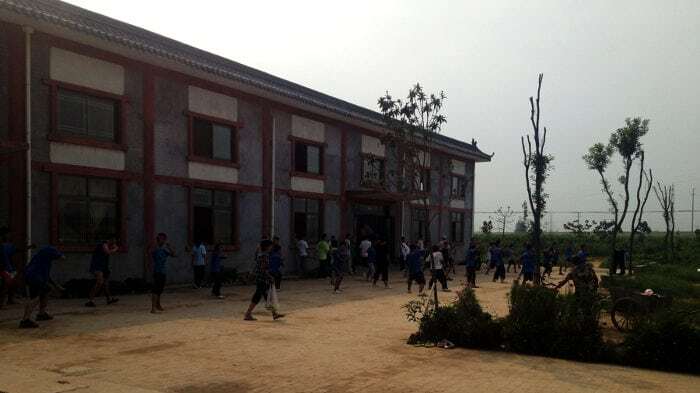 The children of Chenjiagou more or less attend Taiji Quan schools permanently, since for them the martial arts represent a more attractive alternative than a future of misery in the fields. 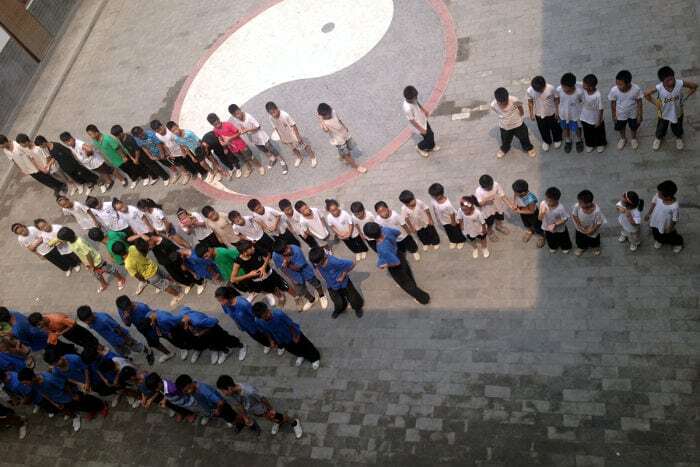 Besides local residents, all these schools, as far as I know, host for at least some period of time both Chinese and foreign students; if the former are privileged by knowing the language, the latter are surely well-received both for the possibility of spreading the school’s worldwide fame and for the dollars paid for training. It is both possible and recommended to make contact via e-mail before leaving, if only to ask for information about the cost of the school and lodging. So as to avoid bitter disappointment, keep in mind that in general the act of staying and training in the school of a famous teacher doesn’t necessarily mean that you’ll practice with that teacher, unless you specifically request him and are willing to shell out a rather steep surcharge. In reality it’s not even certain that you’ll get to see him, the teacher, since many teachers in Chenjiagou spend a good part of the year involved in world-touring tournaments: it’s best to find out first! The fees, on the other hand, are much lower than those charged by the same teachers in Europe and even in their absence the instructors authorized to teach in Chenjiagou are all of the highest caliber. To satisfy my thirst for Taiji Quan, I enrolled in the school of Chen Bing: 20th generation of the Chen family, with a solid reputation and numerous opportunities to see him again later even near home, given his habit of traveling quite a bit. I can therefore describe only how they handle training in his school, but comparing with others who chose different experiences it doesn’t seem like there’s much difference, since we are in the realm of tradition. The school is a rather recent three-story construction, with rooms that face the inner courtyard, a common cafeteria and a large gym. At the time of my visit, it was attended by a hundred young permanent students, coming from Chenjiagou and its environs, and by a few dozen Chinese guests. As far as lodging goes, The Chen Bing school is famous for being particularly suited for the most sought-after amenities by western guests. I think this is due to the fact that some rooms have air conditioning (indispensable in the summer), because the rest don’t really feature much in the way of comfort: two beds, a small table, a bathroom and a considerable amount of filth to sweep away before being able to consider it habitable. Even here the dust is on every surface and finds its way into every crack, no doubt greatly contributing to the sensation of dirtiness. Fortunately you won’t have much time or energy to pay attention to the sanitary conditions: The life of Taiji Quan practitioners, Chinese and foreign alike, follows a rather intense routine. You wake up early in the morning, have a breakfast of steamed greens and bread, then train in the gym or courtyard until eleven or twelve. Lunch is greens and rice, three hours of rest and then training until evening, ending the day with another meal of greens and rice. Every once and a while together with the greens, the award-winning village chef will offer you a piece of smelly tofu, a hard boiled egg or a rooster’s head, just to keep you in shape. In the unlikely event that you don’t like rooster’s heads or the monotony of the menu makes you uncomfortable, you’ll always have the option to find a ride to Wenxian or visit a grocery store where at your own risk you can integrate a local product into your diet. But you’re not there to get fat, right? You’re in Chenjiagou to sweat, and I assure you that you will until every centimeter of your shirt is soaked, whether you chose personal training with a world famous master or if you settled for practicing as a group or under the direction of instructors. In each case, you will begin the day with a warm-up session and stretching and then as a group review the basic form of the Chen style, either in the courtyard or gym. Once you’re warmed up, you’ll have the chance to delve into other forms or practice with the most determined practitioners of Taiji Quan in the world, training yourself all day with bare hands or weapons, practicing tui shou and always finding someone capable of answering all your questions about Taiji Quan. That is, if you know Chinese, obviously, because you can’t expect to speak English with more than three or four people in the entire school. As far as discipline goes: no one will come and call you if you sleep late or obligate you to do the training, nobody will tell you how to dress or what color your shirt should be, but common sense would suggest that you listen to the instructors and not put their great patience to the test. On the other hand, all the students seem disposed to cooperate and teach whatever little or much Taiji Quan they know, with little or no sense of competition – all are inclined to listen and have respect for those that train diligently. If after six or seven hours of daily training you find yourself still too relaxed, you can always ask to join a group of local students. Thanks to youthful energy and the fact of having practiced Taiji Quan for literally their entire lives, these teens represent the elite of the school and are preparing themselves to become the next generation of teachers, subjecting themselves every day to the hardest training from the first rays of dawn to well after sundown. Just the sight of them should fill you with enthusiasm and reverential awe. One aspect you should keep in mind are the weather conditions: Henan is characterized by a continental climate, with strong winters and extremely hot summers. Either way your suffering is assured, since obviously the gym is not equipped with a heating system or climate control and you’ll find yourself forced to train while wearing various layers of clothing or, on the contrary, to continuously stop and drink in order to rehydrate from the copious amount of liquids that have dropped to the floor. Toward evening the wind often blows, raising up clouds of red dust that will give the village a surreal atmosphere and another coating on everything. As you practice your relaxing Tai Chi in the park alongside your grandmother on Sunday morning, or carefully wipe your shoes before entering the gym so as not to ruin the floor, it might cross your mind to ask yourself if it’s really worth the trouble of going to the other side of the world just to basically repeat the same exercises that you can learn comfortably at home. Obviously I can’t give you a satisfying answer: it’s true that in Chenjiagou they have the best teachers, but it’s also true that you’ll perhaps need to stay in Henan for months, if not years, before noticing a real evolution in your own style of Taiji Quan. You will not come back a master and instead, after seeing the best there is, you will lose all desire to put on airs. The truth is that while you’re absorbed in meditation in the tree position and a flock of sheep crosses the street in front of you, or you’re repeating the Lao Jia for the hundredth time trying to understand why your hip is never relaxed enough and your punch is never sufficiently explosive, while you stomp your feet and jump on a floor covered by dust and spit or you watch the children of Chenjiagou return to their training with a smile on their lips and a shirt covered in mud, you won’t ask yourself those kind of questions. You’re there – you’ll never think of Taiji Quan the same way and you know that it’s worth all the bloody trouble. Hii could you tell me how much it costed you? And for how long were you there?